We'll match prices if you find a cheaper offer! We’re committed to finding you the most affordable rentals in the USA. If you can find a better nightly rate on a comparable vehicle, we’ll match it! Get the best price on the vehicle you want, and you're ready to let the journey unfold. All you have to do is email us the quote you received, or fill in the form below! Make sure you have a screenshot of the cheaper offer, and a link to the vehicle. A comparable vehicle is a vehicle of similar age, class, berth, size, and amenities. Similarity is determined at our sole discretion. 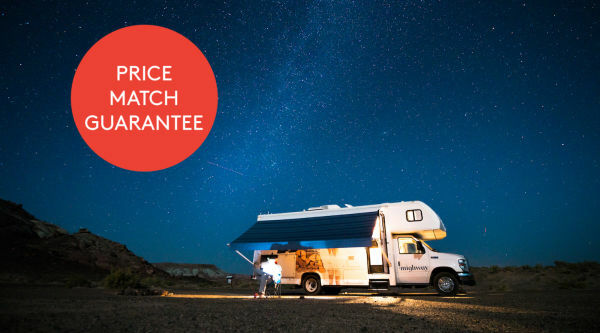 Price matching only applies to nightly rates, not including extras, roadside, services fees, or insurance. Price matching will be for the same vehicle type, dates, pick up / drop off locations & terms, and offered in USD. Price matching is valid for 48 hours. Mighway must first validate the quote prior to offering a price match. Price matching valid on initial quote only, and is non-negotiable beyond our initial offer. Price matching is at the sole discretion of Mighway, and Mighway reserves the right to withdraw this offer at any time. Valid for bookings travelled between January 1st - March 31 2018.